Other number 2310507-0001 part no. The Silent 700 portable terminal was a highly-popular device when first introduced in 1971. Reasonably priced, its built-in acoustic coupler allowed the user to call into a remote computer system from any telephone and engage in interactive computing sessions--something which previously had required much larger terminals. It also came with a built-in thermal printer, allowing for logging of any session. Maximum speed was 300 bits per second (bps). Original TI Press Release (via http://www.ti.com/corp/docs/history/silent700.htm) New Product News H-104 April 1, 1971 Texas Instruments Announces New "Silent 700" Portable Terminal Houston, April 1. A new addition to the "Silent 700" Electronic Data Terminal line was announce today by the Digital Systems Division of Texas Instruments Incorporated. This latest introduction is the Model 725 Portable Data Terminal which is designed for timesharing users, and features a built-in acoustic coupler attractively packaged in a luggage-type carrying case. The self- contained data terminal offers mobility and convenience, and allows rapid access to a remote computer anywhere a telephone and a standard electrical outlet are available. Designed for quiet and reliable high- speed printing, the Model 725 terminal employs the most advanced MOS/LSI integrated circuitry and TI's unique silicon integrated circuit printhead. For maximum reliability, "Silent 700" terminals have been designed to use a minimum of moving parts, eliminating wear elements common to conventional teleprinter terminals. Standard features of the Model 725 terminal include: switch-selectable printing speeds of 10, 15 or 30 characters per second, built-in acoustic coupler with carrier detect light, switch-selectable half or full duplex operation, and operator adjustable print contrast. Optional features include: lower- case alphabet, answerback memory, and an auxiliary input/output parallel interface connector kit. As in all "Silent 700" terminals, the Model 725's rapid and quiet, non-impact printing results from its innovative solid-state silicon printhead û an integrated circuit matrix of 35 elements which instantly create the desired character on heat- sensitive paper. The Model 725 also features the capability of printing 94 USASCII characters with a printing format of 10 characters per inch, and 80 characters per line at 6 lines per inch. Data transmission is switch-selectable at 110, 150 or 300 baud over standard voice-grade telephone lines. Texas Instruments states that the Model 725 terminals are in production, and that deliveries are available 30 days after receipt of order. The company also said demonstration units are available from their offices located in most major cities in the country.. 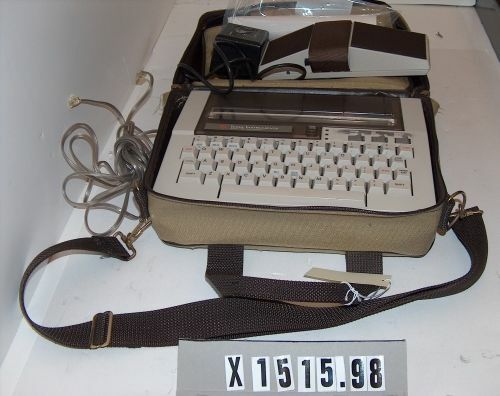 Object comprises a small printing terminal with integral keyboard in a fitted carrying case, together with an AC adapter, an acoustic coupler, and a telephone cord.